Free from Nov. 30th to Dec. 4th, 2015! After trying to deal with my chronic IBS for many, many years, I decided to use my drawing "chops" and my sense of humor to make some lemonade out of lemons. And that lemonade was the creation of this book. There is something to be said for drawing cartoons and finding the humor in situations that are traumatic, sad, or just plain ridiculous in life . I've always loved doing that, and I think this time I have put those cartoons to good use. The book starts at the beginning of my IBS saga, on my honeymoon in Hawaii. I became very ill with some kind of intestinal bug or parasite, and this was the start of what I later learned was "Post-Infectious IBS". Not terribly romantic, and many troubling symptoms never went away. I then entered, and got caught up in the world of traditional medicine and alternative therapies. These experiences provided fertile territory for my cartoons. I have spared no one...Doctors, clueless friends and relatives, hucksters and charlatans. 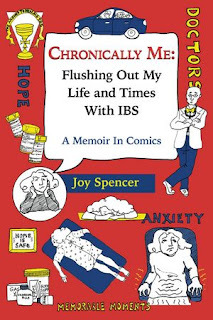 Life goes on, but now my take on living with IBS is part of it!